In this synth patch tutorial, you’ll learn about synth sound design from Adam Fielding as he demonstrates how he created his “Windwave” patch in Europa, available for free at FieldingSoundWorks.com. At the heart of Europa are three powerful spectral wave engines capable of creating complex soundscapes. When designing the Windwave patch, Adam used all three engines to create different sonic layers. Each engine features over 30 wavetables including traditional analog shapes and complex waveforms that respond to your performance. Or load your own samples as custom wavetables and create sounds unlike anything you’ve ever heard before. Europa features four versatile envelopes, three LFOs, and an advanced Modulation Matrix for tweaking just about any parameter you can imagine. Add a sense of movement to your patches by morphing between wavetables. Create chords from a single key using shifting harmonics. In Windwave, Adam used an LFO to modulate the pitch drift parameter for a natural, organic sound. Choose from 24 classic analog modeled filters to shape your tone. Or use the advanced Spectral Filter for sound processing that most filters only dream of. Load your own samples as custom filters for far-out effects. You can even modulate the cutoff point to open and close the filter, making tracks brighter or darker over time. Make your synths sound larger than life with the Unison module. Use the count control to add depth with subtle doubling effects. Increase the stereo width with the spread knob. Fatten up patches with subharmonic frequencies in octave down mode. Adam mades great use of the Unison module when designing the Windwave patch. Polish your tracks to perfection using the built-in effects rack. Tweak your tone with the parametric EQ module. Add punch to your plucks or sustain to your pads with the compressor. Create space and depth with the reverb, delay and phaser modules. Or mangle your sound with six different kinds of distortion. When designing the Windwave patch, Adam combined all three oscillators, multiple modifiers, and advanced signal processing to create an ambient, atmospheric soundscape. Engine 1 uses the Robot Ramp wave with harmonics modifiers and Unison detuning to create a shifting fifth chord with a soft, glassy texture. To compliment this layer, engine 2 uses a chaotic-sounding transformer wavetable to create a breathy sound that spans across three octaves. Engine 3 uses a simple saw-triangle wave with the Unison module in octave-down mode to deliver a powerful low-end, filling out the frequency spectrum. Now that you know the basics of how to design synth sounds in Reason 10, it’s time to start creating your own custom patches! 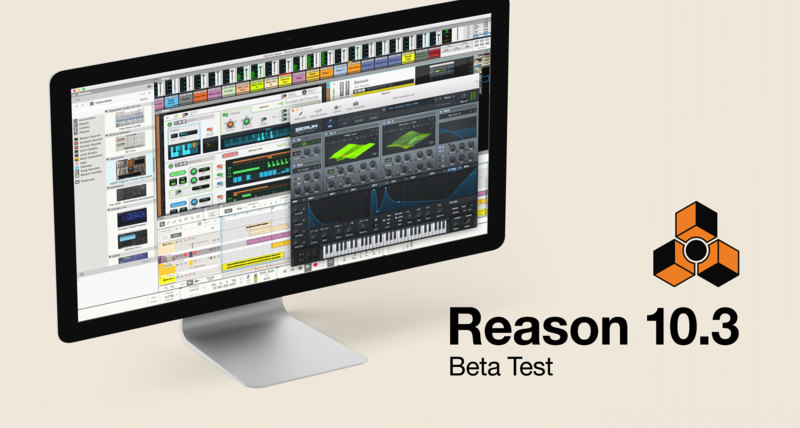 Start your free trial of Reason 10 today! Click to read the exclusive SOS review now for free! There are few things more satisfying than a fat bass synth, and Reason is full of go-to sounds to bring huge low-end to your mix. But for those who like to dive in and tweak some knobs in search of the perfect sound, it can be even more gratifying to design your own bass from the ground up. This sound design tutorial will focus on how to make a bass patch in Reason with Subtractor, the beloved analog-modeling synth with a fat sound and a few tricks up its sleeve. To get started making a Subtractor bass patch, first right-click anywhere on the instrument and select “reset device” to set all controls to their default state. Then set the polyphony to 1 to make your patch monophonic for a tight bass sound. At first, you’ll hear a very basic, no-frills sawtooth wave—don’t worry, you’ll be turning this humble patch into a thick, beastly bass in no time! Subtractor’s sound starts at its two oscillators, which feature 30 different waveform options. Here, you can also adjust each oscillator’s octave, tuning, mix level, and more. These options can produce some pretty far-out tones, but simpler is often better for bass sounds. Try using a square or sawtooth wave with rich harmonics, supplemented by a rounder triangle or sine wave an octave below that for a thick, assertive tone. To change up your sound a bit, switch the phase mode to X or – and adjust the phase knob to create unique variations on each waveform. Next come Subtractor’s analog-style filters, which shape your sound by subtracting certain frequencies (this is also where Subtractor gets its name). Low-pass filters are a great choice for bass patches, because they cut out the high-end to emphasize the low-end. Subtractor has two types of low-pass filters: LP12 gradually rolls off the highs, while LP24 has a steeper cutoff. The frequency and resonance controls fine-tune the sound, and the keyboard tracking control adjusts the filter when you play higher or lower notes. A second low-pass filter can be linked to the first for even more tonal possibilities. By now you’ve quickly built a rich bass sound with plenty of analog character, but it may still sound a little static. This is where the envelope section comes in handy—envelopes shape your sound over time, from the initial attack of each note to the decay, sustain, and release time. The amp envelope uses these parameters to control volume, while the filter envelope affects the filter frequency instead. Combined, Subtractor’s envelopes can deliver anything from funky wah-wah-type sounds to slowly morphing swells. Oscillator, filter, and envelope combinations offer a ton of possibilities, but the fun really begins when you modulate those parameters to add motion and expression to your sound. Subtractor’s two LFOs (low-frequency oscillators) can be used to rhythmically control parameters including oscillator pitch, phase, or filter frequency, which produces a dubstep-style wobble when synced to tempo. The mod wheel can also be assigned to different parameters, including LFO speed. Finally, Subtractor’s velocity section allows you to control how the dynamics of your playing affect the sound. And there you have it—all the sound design knowledge you need to get started making an analog bass patch with Subtractor. Once you’ve mastered the basics, these principles can be applied to many other Reason devices and Rack Extensions, opening the door to limitless possibilities. UA’s latest update includes the new V76 mic pre plug-in, the latest version of Antares’ Auto-Tune, and a mean recreation of a classic German guitar amp. Equalizers change the way an instrument sounds by altering its frequency response. Just like a car stereo, they can be used to add more “bass”, turn down the “treble” and much more. Most EQs use multiple bands to give you control over separate frequency ranges. Parametric EQs are typically broken into low, low-mid, midrange, high-mid, and high frequency bands. Each band uses three basic controls to shape sounds: frequency, gain and “Q”, or quality. The frequency control allows you to select the specific frequency you want to adjust for each band. The gain control is used to control how much you cut or boost the selected frequency. The Q knob adjusts the slope of your EQ curve. Bands with low Q settings have a gentle slope that affects a wide range of frequencies, while high Q settings offer a more focused shape. Cutting frequencies is called subtractive EQ, and works well for making tracks sound cleaner or clearer. Boosting frequencies is called additive EQ, and is better for emphasizing a specific frequency range in a recording. In addition to these controls, there are three basic EQ shapes: filters, shelves, and bells. Filters do exactly what the name suggests—they filter out unwanted frequencies above or below a certain point. Filters are useful for removing unwanted low-end rumble from recordings, or taming the high-end on harsh-sounding instruments. Shelf EQs can be used to cut or boost frequencies above or below a certain point. Shelves are commonly used to add low-end to kick drums, add high-end to guitars, or toning down overly bright cymbals. The bell is the most common and versatile EQ shape. With a high Q value, they offer hyper-narrow curves ideal for pinpointing and reducing problematic frequencies. With a low Q value, bell curves offer a subtler slope over a wider range of frequencies, which works well for boosting. Learn how to carve out space for each instrument using subtractive EQ. Train your ear to identify problem frequencies using the sweeping technique. Now that you know how to use an EQ, it’s time to get mixing!